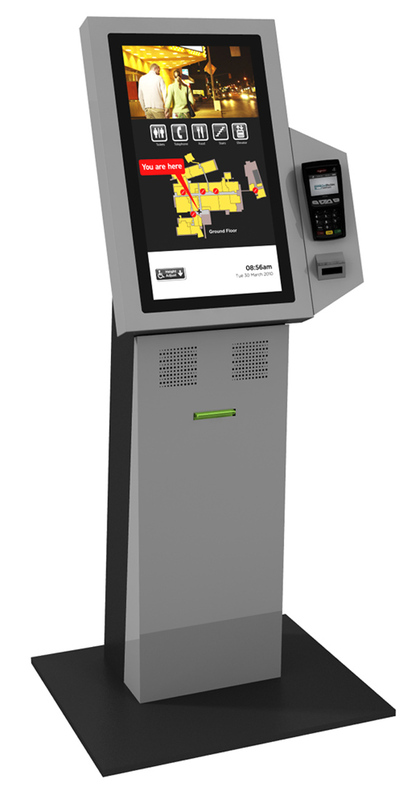 The Premier is a stylish, mid sized kiosk solution. Designed to attract users, this kiosk maintains it’s elegant good looks in any environment. The Premium ultra-high resolution 22” display allows for easy viewing of pictures and text from any angle. Ideally suited for way finding, product ordering, visitor check-in and any application where self-service and instant information is key to your business. The Premier keeps your business operating in style. For permanent installations the Premier can be bolted directly to the floor for added stability and security with the power and data cords directed through the base. From printers to card readers, bar code scanners and EMV terminals, you have the ability to tailor this kiosk to fit your exact needs. Because you can choose from a nearly limitless selection of colors and graphic wraps this kiosk truly reflects your business’s image.